Sorry.. I meant the jp100- 6 strings.. The 7 strings are jp70s.. Recently bought a AX3 from AMS. 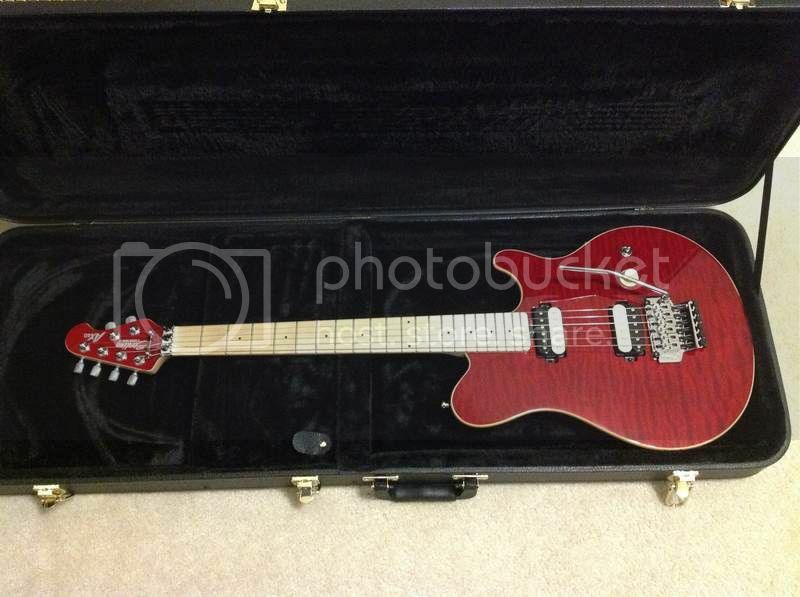 Selling points were 5 position toggle, decent maple neck, look, and PRICE. Immediately started trying to set intonation (should have changed strings first). Noticed that the strings were leaving gray marks on the fretboard. After I removed the strings I noticed that the maple fretboard was rough from the 7th through 12th fret (bad sanding job? overspray? ), I smoothed it out with 00 steel wool. Setting the intonation I had to bottom out the saddles especially the low E. I noticed it wouldn't stay in tune and it was pointed out to me that the bridge at rest was high on the back not flat. I tried tightening the 2 springs it came with but that was still not enough tension so I added a third spring and that did it but now the vibrato is stiff (never been much of a wammy bar guy anyway. Emailed AMS and told them my complaints, they offered to take it back but at this point I felt I was starting to have a decent guitar. Had to dress the frets ofcourse. Looks and sounds great. Single coil settings seem to sound better than the double. Was thinking of trading out the stock zebras for a pair of black seymours, LP style cream pup rings (don't like the pups mounting straight to the body) and painting the headstock to match, thought it might give the guitar a classier look and cover up the big SUB on the head. Thoughts? ...Was thinking of trading out the stock zebras for a pair of black seymours, LP style cream pup rings (don't like the pups mounting straight to the body)...Thoughts? The truss-rod adjustment wheel will interfere with a neck pickup ring. How many springs come with the Silo3 (Haven't removed the plate to look)? On Strats, adding a 4th or 5th tremolo spring is said to improve bridge and tuning stability. My Silo3 stays reasonably well in tune, but has anyone tried adding additional springs? 2 springs, came stock on my AX3, the pup ring could be ground out around the truss rod adjustment. Ordered the pickup rings for cheap on ebay, will send pix if I install. Installed a 3rd spring, stays in tune better but now bar is pretty stiff. Do love the playability and sound options of this guitar. Pups sound a little weak. Still getting a bit of a problem with the fretboard greying after play. Will try smoothing it out some more on mt next string change. Pup rings came in, will install them soon, if they look ok with the test fit. What did I do and how much did it cost? Pair of flat bottom, cream pup rings; Dragonfire chrome covered, screamers; sealed the fretboard with urethane; new top nut; painted head stock to hide the big SUB; and you already know about the added tremelo spring. Thought I really messed it up bad when I couldn't get the intonation right, took it to a trusted luthier, found out the strings were too high at the nut. Fretboard turned out nice but had to polish and polish to make it come out. Dragonfire screamers are awesome and quiet, single coil sounds great too. Techs did the set-up and while they were at it put in the new pups = $188 + dragonfire pups= $30 + rings and high gloss car paint= $10 + guitar cost me=$225? from Musicfriend (best deal) = $453 not bad I think. Now if you'll excuse me gonna play this thing until my fingers fall off. ...as long as we were able to provide you with a platform for you dream guitar on a budget, and you dig it, and it works for you and the way you see fit to modify it to get you where you want it to be, that rocks! Glad you enjoy it and hope that it takes you to that special musical place of fun and inspiration. On a serious note, thanks for choosing one of our instruments to help get you there! Note to Sterling; Love the toggle and electronics setup. Pups are expectedly mediocre, not bad for a guitar in this price range and finish is nice. More attention should be paid to the fretboard finish, the nut, and lose the ugly SUB at the top; it makes me think of something being sub-parr or a 2nd or the cheap one. Pay closer attention to the placement of the bridge had to take the springs off and move the saddles all the way back to get the intonation right. Just a suggestion, I personally thought it made the guitar look cheap and 2nd rate. I knew I was going to paint over it and make it look more like a more expensive Musicman as soon as I got it. My Red AX40 I bought last year. It was stock but I've begun to modify it. I swapped out the tremolo arm because I didn't like the angle of the Sterling arm and I just changed out the toggle switch. I have a Gotoh Floyd Rose on order so that I can install a D-Tuna. Pickups are probably going to be my next modification. 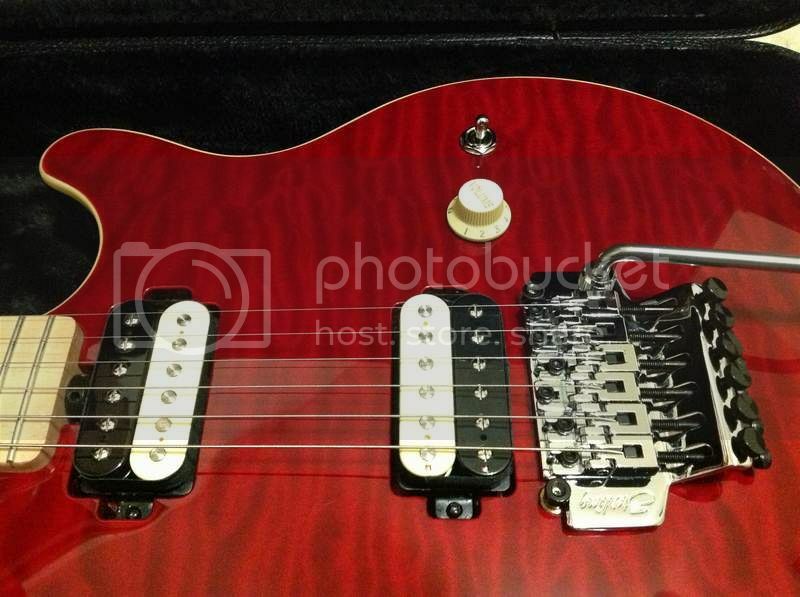 I keep hearing Tone Zone and Air Norton but I'm also looking at EVH pickups. @BenB5150 Nice guitar! Love the color. Please keep us posted on the tremolo swap. I'm interested to follow that mod.